Does your skin lack tone and density? Do you suffer from wrinkles and fine lines? A dull complexion? Instead of treating each of these problems separately, today we prefer to employ a global anti-aging approach that blends various different cutting-edge techniques, which work in synergy and bolster each other’s efficacy, as part of a bespoke aesthetic medicine procedure. Regular aesthetic medicine treatments are required to combat skin aging. But finding the time to attend numerous appointments is often an obstacle. Thanks to the creation of a complete procedure that combines three sophisticated, safe and non-invasive cell regeneration treatments – PRX-T33, Venus Viva™ radiofrequency and LED therapy – in one single session, we can achieve remarkable, long-lasting results in record time. PRX-T33 is for anybody who is reluctant to undergo cosmetic procedures that use an invasive technique. Thanks to its patented formulation, PRX-T33 offers immediate and natural-looking results, leaving the skin plumped and toned. The treatment is suitable for all phototypes, including black skin, and can be carried out in any season. After discussing with the patient what problem it is they want to treat, the doctor will apply a dose of PRX-T33 serum onto the treatment area. The product is massaged into the skin, where it will provoke a turgescence (swelling). This turgescence will plump up the dermis and help it to recover its lost radiance. What is the difference between biorevitalisation and a peel? Biorevitalisation stimulates the skin so that it is regenerated and recovers its lost radiance, tone and elasticity. Unlike a chemical peel, PRX-T33 stimulates the dermis thanks to fibroblast growth factors without exfoliating the epidermis. In this way, the skin is not damaged and does not peel. Patients do not experience the “frosting” effect that follows a peel. Does the PRX-T33 treatment have any side-effects? You may experience a slight prickling sensation around the treatment area. You can expect your skin to look a bit pink or red, but this will gradually disappear and leave behind renewed skin. Can PRX-T33 be combined with other treatments? PRX-T33 is a treatment that can be carried out on its own or alongside other combined techniques, such as fillers, peels or even mesotherapy. This association enables us to potentiate the results of both treatments. By combining it with PRP, we can encourage hair regrowth and tissue regeneration. It enables us to stimulate and strengthen the capillary fibres. After carefully cleansing the face, neck and décolletage, the procedure begins with a needle-free biorevitalisation technique called PRX-T33. The doctor applies a few drops of this innovative gel onto the skin which, thanks to its specific concentration of trichloroacetic acid, stimulates the activity of the fibroblasts − cells which manufacture collagen and elastic fibres, which are vital elements of the skin’s framework. Kojic acid is used to treat skin hyperpigmentation and to purify the complexion. The product is massaged in by hand until it has been fully absorbed. Result: An instant hit of radiance; the skin’s elasticity is immediately boosted, just like with a peel, but without any skin shedding. The procedure continues with revolutionary Venus Viva™ technology. Its secret? Nano-fractional radiofrequency is emitted onto the skin using a hand piece with 160 micro-pins. Each pulse creates a multitude of microscopic impacts in the epidermis, while delivering energy that brings about a rapid and strictly-controlled increase in temperature within the tissue. As the skin has been anaesthetised with a cream prior to the procedure, the patient should feel no discomfort. This controlled inflammatory reaction will reactivate the fibroblasts, stimulate collagen production and stimulate the natural scarring process, which will give rise to healthy, new tissue. The application of a soothing and hydrating hyaluronic acid-based mask completes the treatment. Result: Spectacular reshaping of the tissue from the very first session. The skin is immediately firmer and denser, and the benefits continue to develop over time: the oval of the face is redefined, deep wrinkles are smoothed, fine lines disappear, the eye contour becomes clean and smooth, the skin’s texture evens out and the face looks fresh and rested. Last step: fifteen minutes of LED therapy, whose cold red or yellow light stimulates collagen synthesis and ATP (the energy supply for all cell processes), produces an anti-inflammatory effect and attacks free radicals, which are responsible for premature skin aging. Result: This gentle therapy consolidates the action of the previous techniques, while providing a feeling of utter wellbeing. Benefits of this complete procedure: no invasive techniques, no downtime, no side-effects, and it saves time. It can be carried out in any season and is suitable for women, men and all skin types, including black, dark and tanned skin. It is also highly effective on the rest of the body, in particular for treating stretch marks. Suggested treatment pattern: three hour-long sessions with a month in between. Upkeep: one session per year. 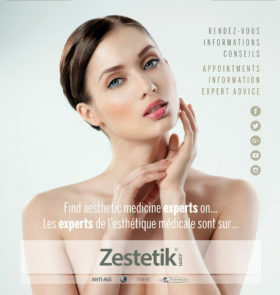 Specialised in Aesthetic Medicine in Paris. 15 years of experience in all aesthetic medical techniques: fillers injections, mesotherapy, lasers, peels. Author of “Gagner 10 ans en 3 mois”. Regular speaker in various media in France and abroad.